How do I shape the audio experience in a roomful of people talking? 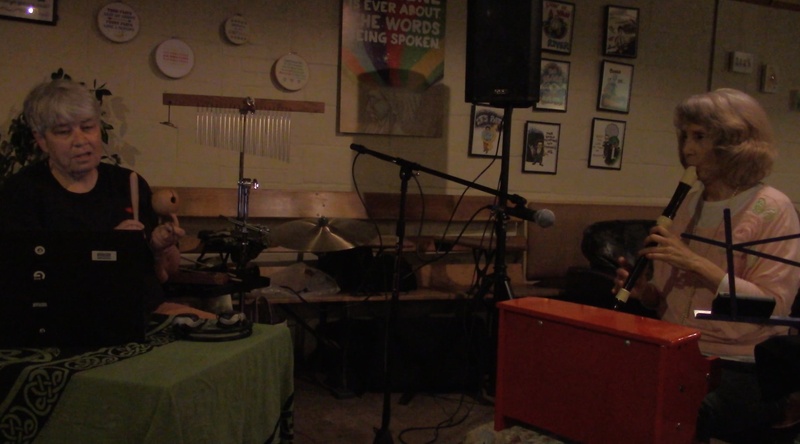 Some interesting developments around this question arose when we played at Open Eye Cafe last Saturday. The intention when playing soundscapes is to massage the sonic space and to ultimately raise the vibration of all who are present. So far, the approach has been to create soundscapes with energetic movement that evolve slowly over time. Then Susanne and I add another layer of improvisational interaction. These interactions happen in the moment and serve to reinforce, contrast or re-shape the soundscape. I remix the soundscape as we go, creating more layers of sonic interplay. This is what we brought to Open Eye on February 7, but I came home with so much more. There was a moderate sized crowd there and people came and went during the three hours we played. I was very focused on the soundscape and Susanne, only giving the room a cursory amount of attention. The soundscape was a strong presence in the room as people chatted, ordered food, studied, etc. We played three soundscapes, each about 40 minutes to an hour. I had my Zoom recorder, and forgot to turn it on until the last soundscape, entitled The Space Between. And am I glad I did! The recording begins with a wild cuckoo cry that is extended slightly by some voices of coffee shop patrons. Listen closely and you will hear a little “ohhhhhh” as the cuckoo cry ends. People in the room interacted with the soundscape almost seamlessly. They added an element of awe at the beautiful surprise of the cuckoo cry! So you will hear that moment right at the beginning, then the soundpainting of the haiku, and finally, the sound of heavy rain water accompanying the clanking of dishes and conversations taking place. Don’t try to hear the soundscape we are playing, instead listen to the whole recording as one soundscape that unfolds before your ears.